The Acro-Matic YT1050 can be supplied in either rotary or linear format. The rotary option suits all ¼ turn applications such as rack and pinion and scotch yoke actuators whilst the linear is easily adaptable to diaphragm control valves and linear pneumatic cylinders. The enclosure consists of 316 Stainless steel which is suitable for the most corrosive environments and has an IP66 ingress protection rating. The feedback shaft also consists of 316 stainless steel which also addresses any corrosion issues which may be encountered. 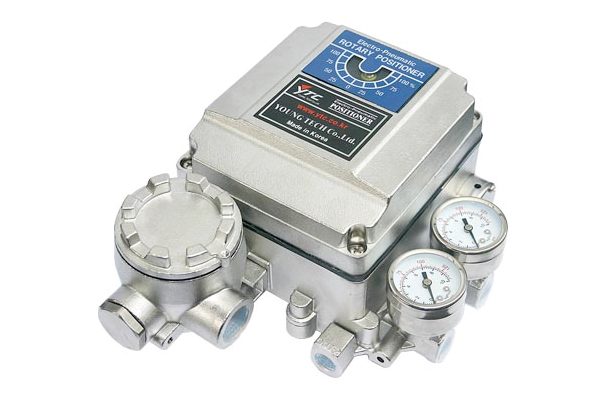 An easy to see visual indicator is standard which indicates true valve position. Low air consumption to around 3 litres per minute is another feature of the YT1050 which greatly reduces operational costs. The YT1050 has the ability to be converted from direct acting to reverse acting and can also be set up as split range. Resistance to high vibration is another key feature offering reliable and trouble free performance. Internally no special tools are required for span or zero calibration. The inclusion of a manual pneumatic override makes trouble shooting easy in the field. Acrodyne can supply a range of mounting kits to suit most rotary and linear actuators.